Prep food the night before in the Rockcrok® and keep it in the refrigerator overnight. Bring it to room temperature before cooking. Ingredients such as vegetables or chunks of meat should be uniform in size, if possible, for even cooking. Use the high setting when you’re short on time, the low setting for recipes that can cook all day and to simmer soups and stews, and the warm setting for reheating already cooked meals. Line the Rockcrok® with parchment or aluminum foil (depending on the recipe) for easy cleanup. When using a slow cooker, fattier meats cook best (they’re usually cheaper, too). Think chicken thighs rather than breasts, brisket, chuck roasts, short ribs, or pork (but not pork tenderloin). Thaw meat that will be cooked whole; it’s okay for meat that’s shredded or in chunks to be used from the freezer in a pinch. Dig into our Root Beer Ribs for a flavorful option that’s sure to please a hungry crowd. Because meals cook for so long in a slow cooker, it makes sense to use dried herbs and spices rather than fresh ones because a slow cooker will overcook them. The spices shouldn’t be added last but rather above the main ingredient (such as the meat) so that the flavor mixes well. This isn’t necessary when making a soup or stew. For recipes that call for broth or stock, consider adding bouillon cubes instead and mix with less water than directed. This will limit liquids in the slow cooker. The Garlic Parmesan Chicken with Cauliflower Mash features a well-seasoned mix of garlic, parsley, and Italian seasoning. Dairy can be used in a slow cooker but should be added toward the end of cooking time to avoid curdling. Make sure it’s fresh, and cook only on low heat. Adding some cornstarch will also keep dairy from curdling and it’s a good option for thickening liquids, too. Alternatively, you can make a roux with equal parts butter and flour plus a little milk to thicken a dish with too much liquid. 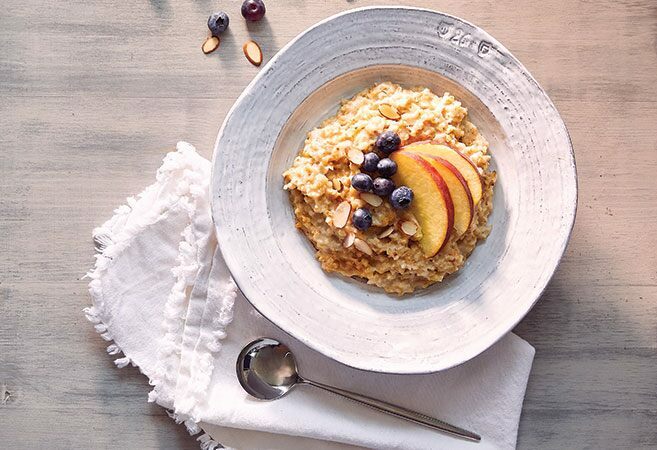 Start your day off with a hot breakfast with Overnight Steel Cut Oatmeal. Typically, meats go on the bottom of a slow cooker, followed by spices, then vegetables, other dry ingredients, and then liquids, which should cover everything. Denser vegetables like potatoes can also go on the bottom so that they’ll cook thoroughly. Speaking of layering, you can also poach fish over a layer of herbs or steam vegetables over a layer of lemongrass on top of water (or another liquid). Your slow cooker can be used to make just about any dish! 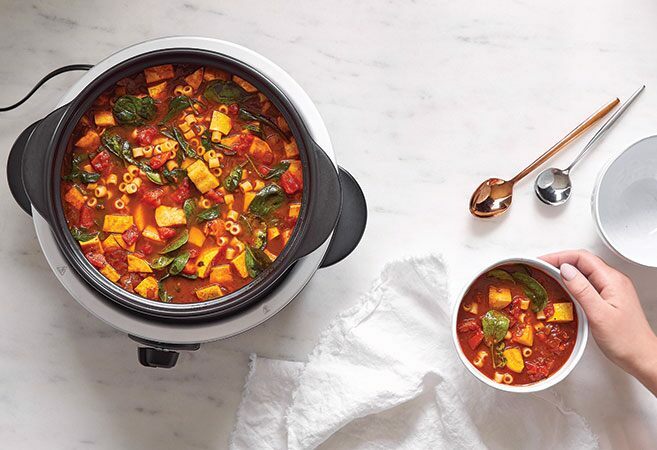 There’s nothing like the smell of our Slow Cooker Minestrone made in the slow cooker on the weekend to gather family around the table. 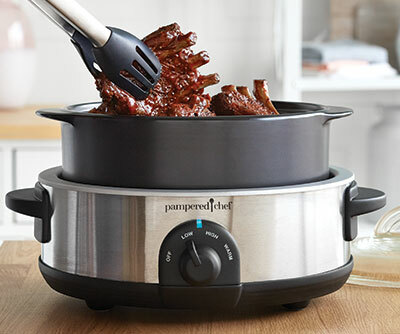 What’s your favorite slow cooker recipe? Share it with us in the comments below. Homemade Chili or the BBQ ribs with a can of Rootbeer and 1.5 cups of BBQ sauce during last 1.5 hours. How hot does the slow cooker stand get? Hi Dawn, I’m still new to the electronic side of things but I just found this question and wanted to answer it. It gets pretty hot. I keep mine towards the back of the cabinet so my kids won’t get burned. Mine gets hot enough to burn you but not hot enough to leave a mark (if that makes sense). Please feel free to send me a direct message through my personal site and I would be happy to answer any other questions you have. 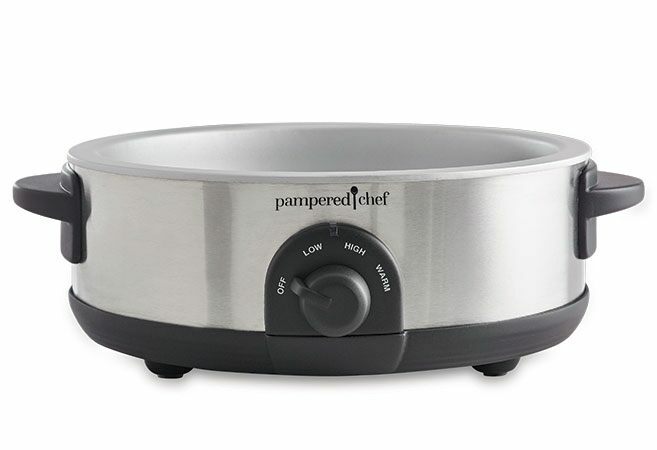 There is a ring that heats up but the entire surface where the control knob is safe! Go to the shop site and in search area put in recipes. Here is a link to our e-cookbooks. you can also search using the search bar at the top of our page. Type in chicken salad and browse through our great recipes. I’m from LA and had I’ll success making my traditional red beans and rice on the rock crock slow cooker, two separate times. Not doing that one again. Ronna, we still have our #1188 Gravy Separator. You can place individual orders anytime. 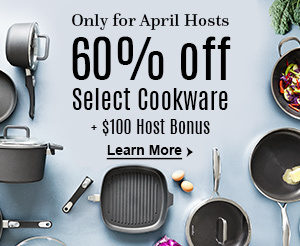 Or be a host for opportunity to Earn products for FREE, 1/2 price and discounted. Yes we do although someone probably already answered your question. Pampered Chef gravy separator the cost is 29.00 that doesn’t include tax n shipping. It’s guaranteed for 3 years and dish washer safe. I made the Garlic Chicken with Cauliflower Mash over the weekend – my husband loved it, but asked me NOT to mash the cauliflower the next time we have it. Easy enough! Can the slow cooker bags be used in the Rockcroks on the Slow Cooker Stand? I don’t see why not. Our stone are super easy to clean so I personally don’t but I have never read a reason why they can’t be. Love the tips and hacks. I’ve never had a slow cooker but I imagine I could cook Broccoli Cheese soup in it or Minestrone. I’ll bet I’d love those. Will the 8 at rokcrock for in the slow cooker base? Only the Everyday Pan 2.5 QT and Dutch Oven 4 QT on the stand. Not the XL. I just received the rock crok base. when I used it the first time it was very hot to the touch on the outside. Is that normal? Does not seem like this is safe. Yes it is normal. I keep mine towards the back of the cabinet and have not had a problem. I recently bought a Rock crock and stand and was so excited to slow cook a delicious pork roast. I had on my counter and because the pot sits so high above the base, i didn’t think of the possibility of getting burned. I was reaching for something behind it, and barely touched for a split second and immediately 2nd degree burn. I have never had anything “melt” my skin that quickly. Blistered immediately….. so WARNING to any parents with children! Once burned, twice shy….. which makes me very sad because I truly was so excited about this purchase. 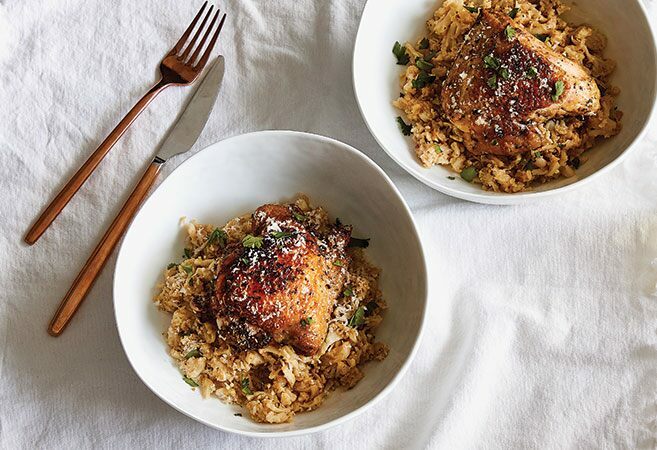 Can’t find anywhere a way to cook chicken breast like crockpot? Can it be done & how long to cook ?? 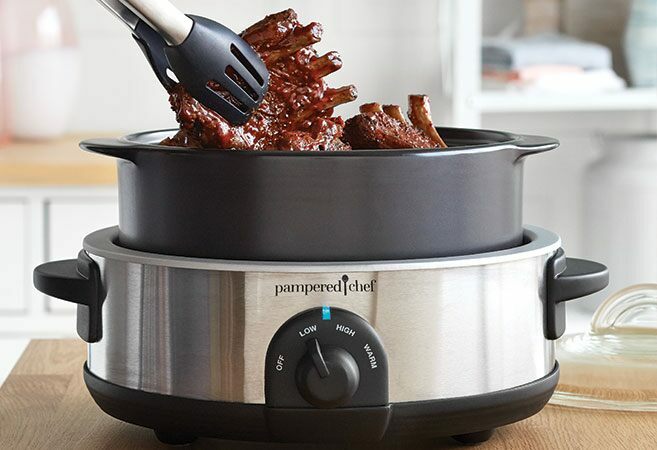 Iam disappointed with this thing I don’t want to microwave food or bake or stove top I bought what I thought could be used as a crockpot can I return ? The 2.5 crock is stuck in the base, any suggestions of how to remove it? I’ve tried oil, ice water…..no luck. To say the least, I’m not a happy camper right now. I was ready to purchase the larger crock, but not sure I want to bother now. Hi Lynn – We’re sad to hear this happened and want to help! Please reach out to our Solution Center at (888) 687-2433 M-F 8AM-8PM. Can I “roast” Cornish hens in rock crok in slow cooker base? With little or no liquid? I just got the Rockcrok Dutch oven and slow cooker stand. I read in one place where it can go from refrigerator to the slow cooker stand and I’ve also read that you should let it get to room temperature. Will I ruin the Dutch oven if I put it in the slow cooker stand when it’s cold?